Crack is whack. Especially on your trophy antlers. 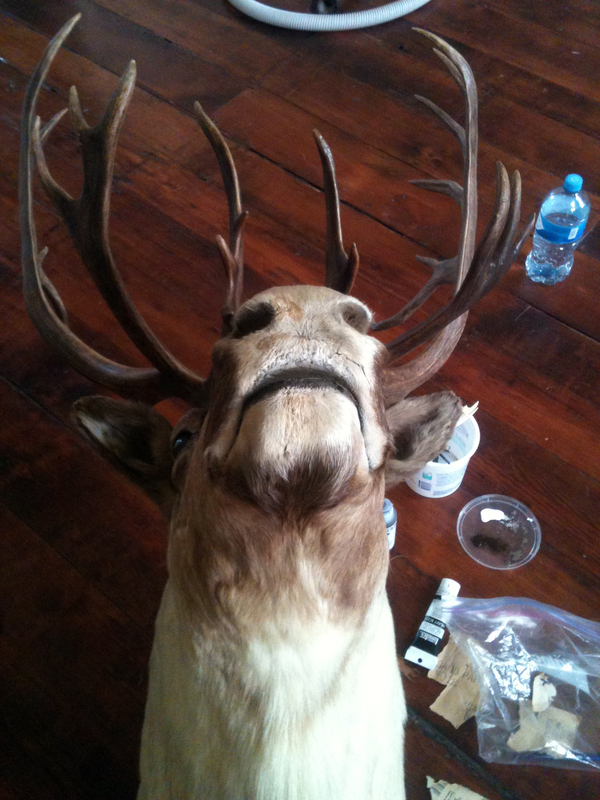 Occasionally I get repair jobs from folks who have damaged mounts, broken antlers or busted skulls. This case isn't much different ezcept for the size factor involved. 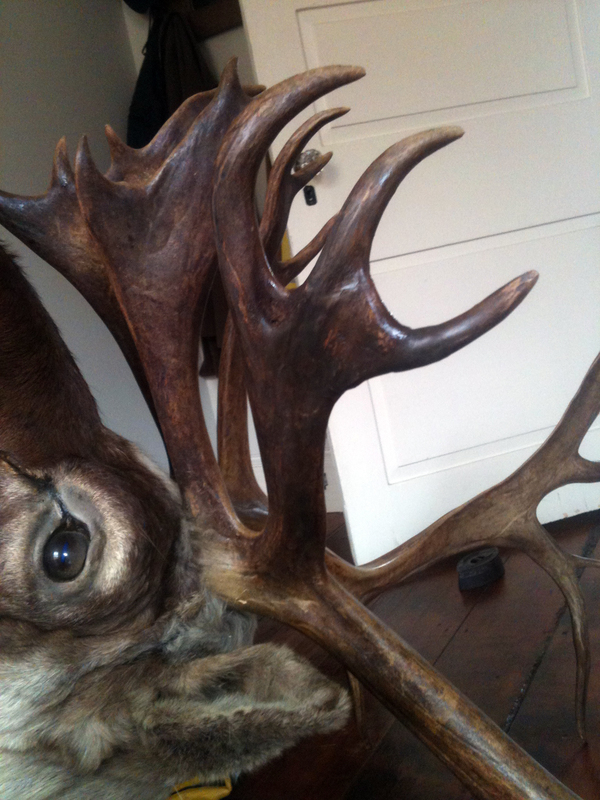 I think these moose antlers make up the largest rack I've ever dealt with. The owner had mounted them to a stone wall outside her house but not in any particular fashion that would anchor them in properly, and over time the sheer weight of these bad boys just pulled them out and they fell off. 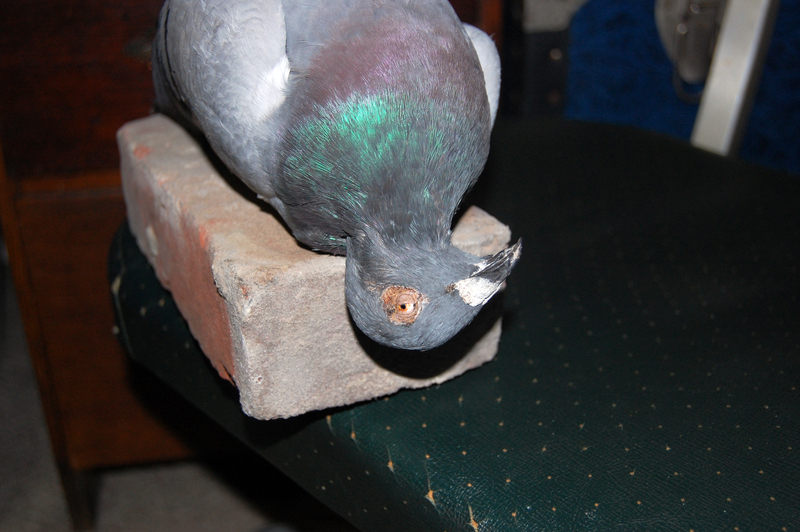 I'm not sure if the fall caused any of the cracking or of all the blemishes/cracks are just general wear and tear. Finished product. I also drilled more stable holes at the base and left her with instructions on how exactly to have it mounted this time around. Extra Extra presents SO FAR SO GOOD, an exhibition of work examining the elements of uncertainty brought forth by recent social, political and environmental upheaval worldwide. Addressing concerns from global economics and capitalism, to political violence and surveillance, the conversation between the artists is presented on a platform of poetic inquiry and investigation. Each was selected to acknowledge the feelings of uneasiness, absurdity, hopefulness, despair, humor, paranoia, and earnest defiance that pervades our present day experience. The work and artists represented are not necessarily providing concrete answers, but asking questions and presenting choices. 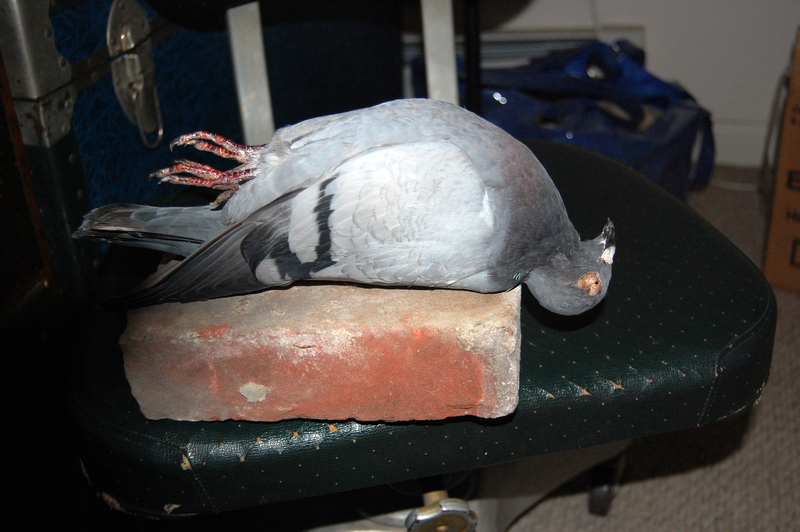 The main difference between the two birds is the angle of the neck and head. Also of note would be the eyes, which are black glass bulbs on the one I received but closed and detailed on the original. 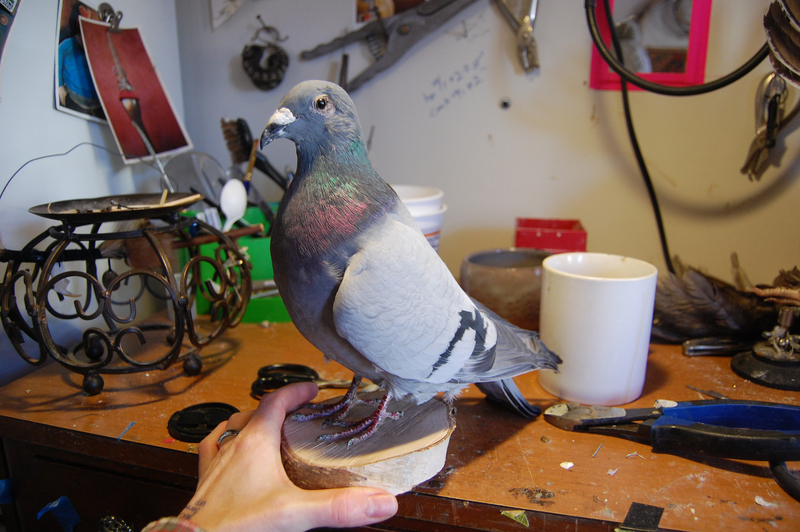 Thirdly, I would have to reposition the feet. Clearly I had my work cut out for me. 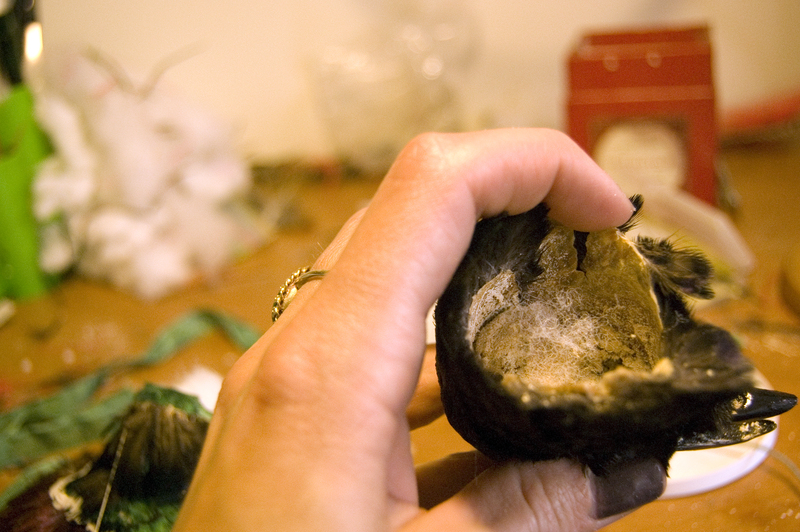 I began by wetting the areas in question to make them a wee bit more malleable. Once I'd worked out the exact spot and angle of the cut, I went ahead. 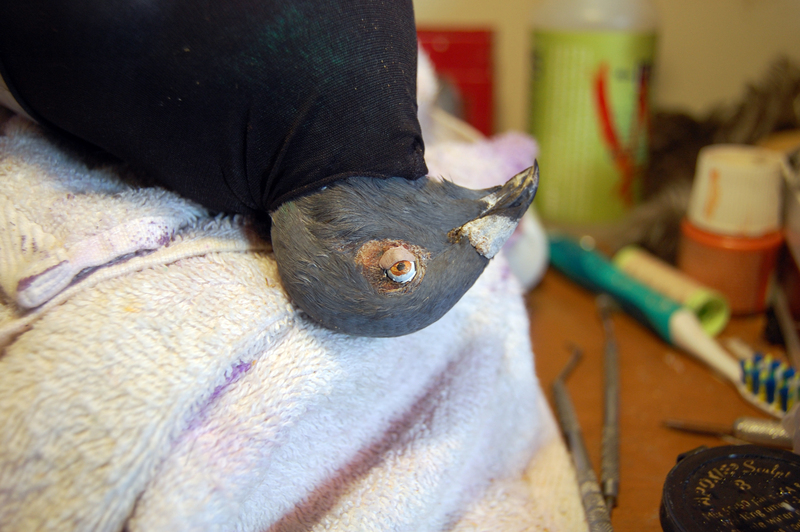 I needed to not only replace the head so it was arched back, but also turned to the side. This proved more difficult than I'd anticipated, but I ploughed ahead. Here it is, most of the way back on. At this point I'd also began to rework the eyes. 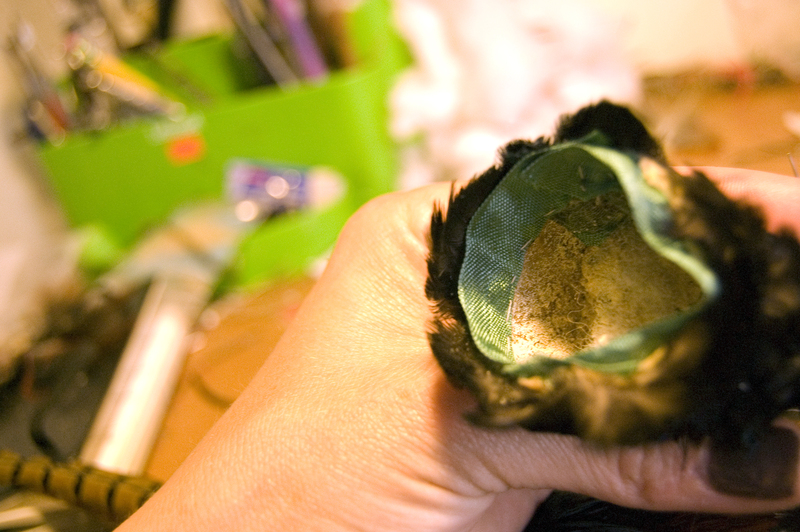 The feathers were understandably a bit ruffled and confused as to where they were to lay after being turned about like that, so I let the whole thing dry with a compression sock on for 30 hours. 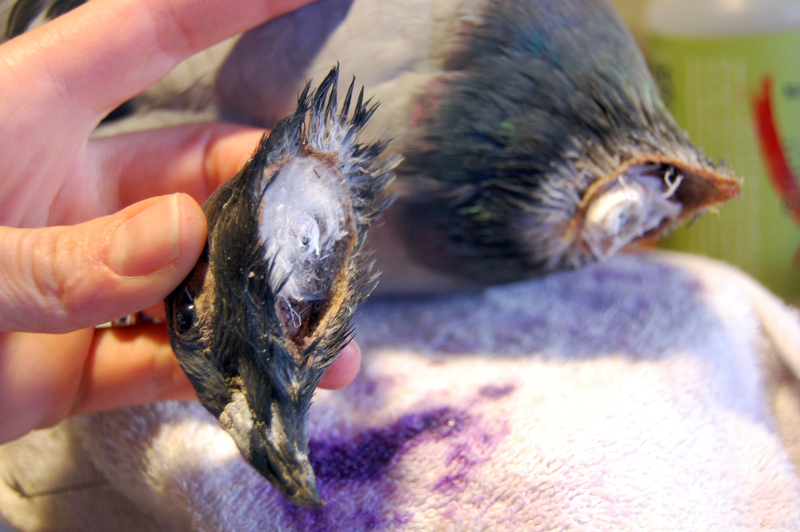 After that I inserted and glued, one by one, teeny feathers from the portion of neck I'd removed into any areas that needed filling. Oh yes, and I repositioned the legs, which gave me a bit of grief but I showed them no mercy. The show opened last Friday and is up until the 12th of February. While I didn't make the opening and have yet to see the dupe in action, I intend to go this weekend and check it out. I invite you to do the same, should you be in the Philly area! A week or so ago, a local hunter contacted me via my Yelp page (speaking of which, why don't you stop over there and leave some feedback about my services, guys and gals? 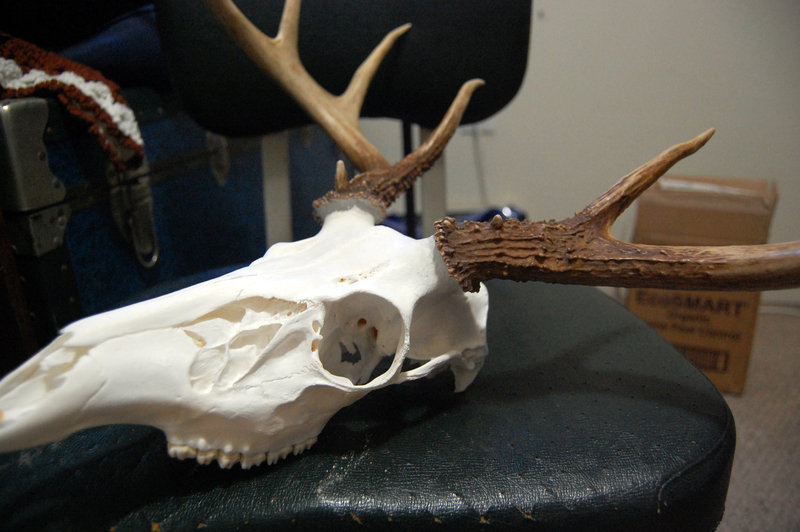 I'd really appreciate it) in search of some professional help with a European deer skull mount he was just about finished working on when the antlers plumb dropped off. 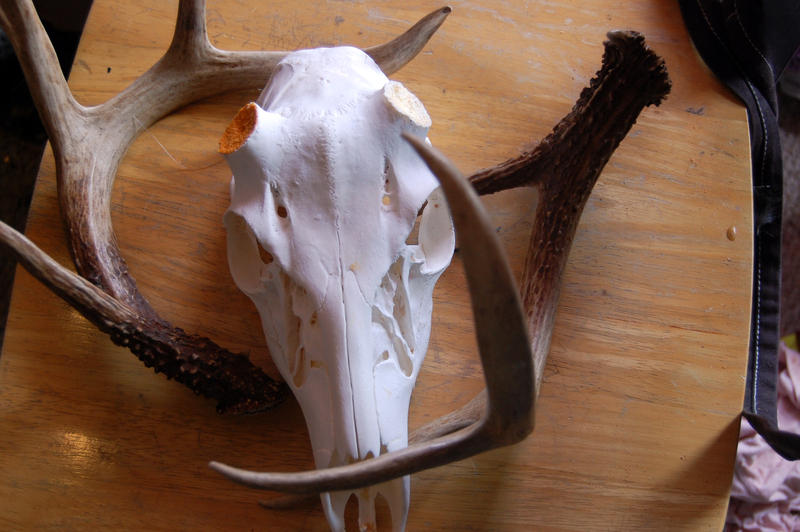 Apparently , the buck was just coming out of rut when he harvested it, and somewhere in the skull cleaning process the antlers decided to fly the coop. Full disclosure: I am not certain that I am using the term "rut" correctly; conversations with hunters and the internet tell me it refers to the period of time when a buck is on the prowl; he beefs up (this much I know from seeing the thick mountains of line-backer neck muscle on trophy mounts caught mid-rut) and makes a lot of noise and fights and all the carnal things that go along with finding a mate. 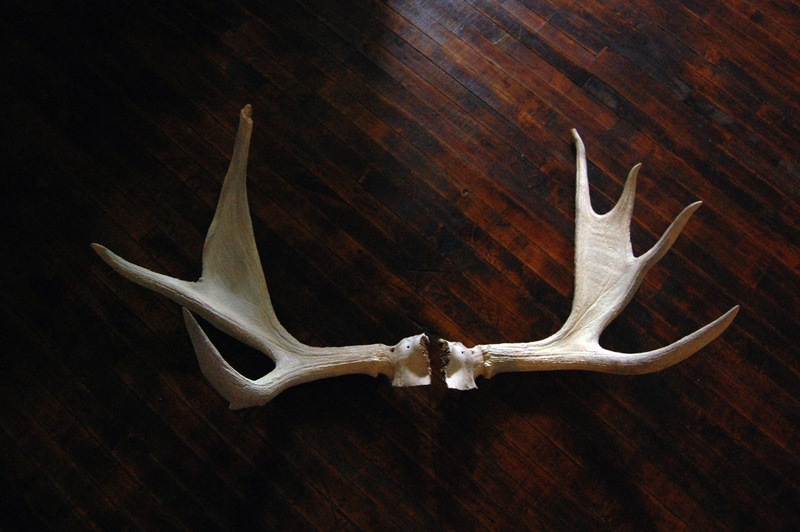 I think the word rut can also refer to when their antlers fall out, which happens every year around late Autumn to early Winter, depending on climate and location. If I am speaking out of term, please let me know in the comments section. Perhaps, I could incorporate some posts from guest bloggers, as I've always been interested in hunting but remain outrageously uninformed. Rest assured, potential clients, my ignorance should inspire confidence in my work! It serves you well to hire a taxidermist who doesn't spend all her time in a tree stand when she should be working on your trophy mount. 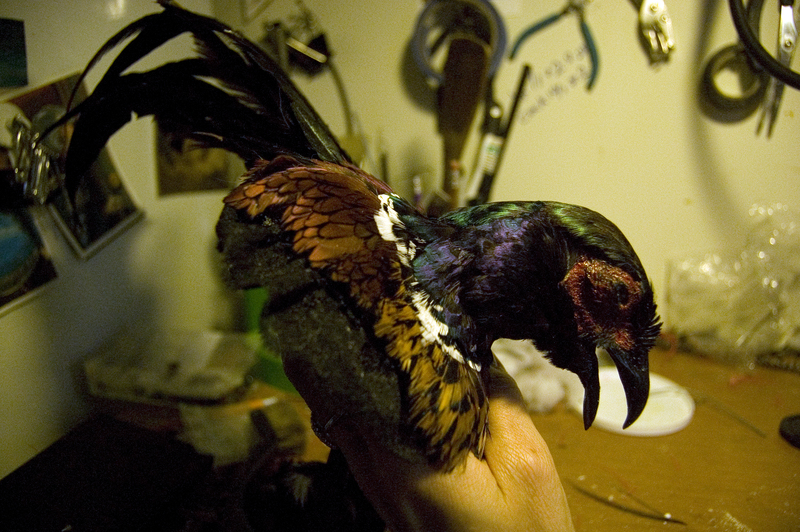 All that said, here is the almost European mount, in three pieces. 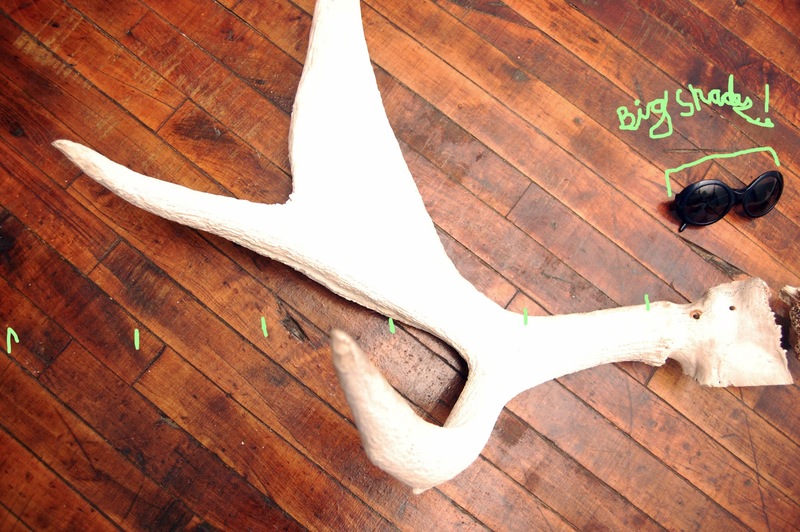 The orange you see at the root of one antler is glue residue from a prior attempt to re-attach them, which proved unsuccessful. Skulls are so beautiful. Treat yourself and take a moment to marvel at how amazing this feature of our anatomy is. 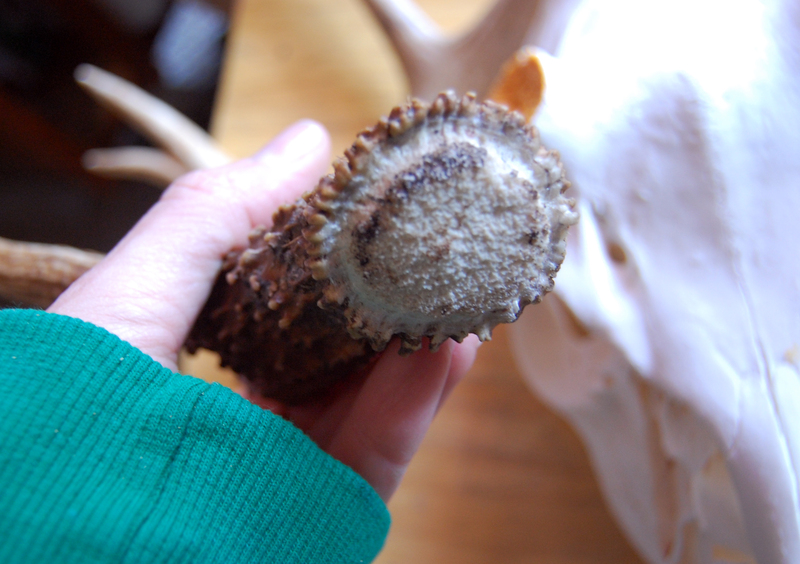 The bottom of the antler. 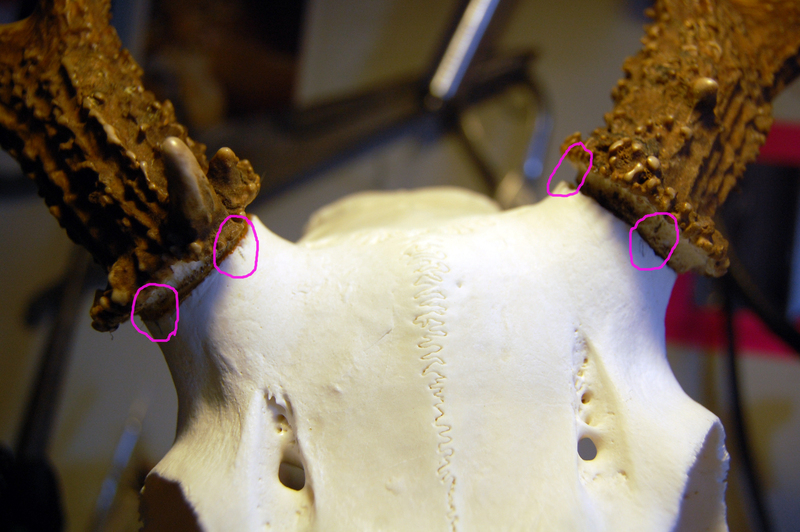 The english-muffin-like texture of the break points makes sense; it facilitates the release of the horns instead of them just falling out with roots like some bloody teeth. 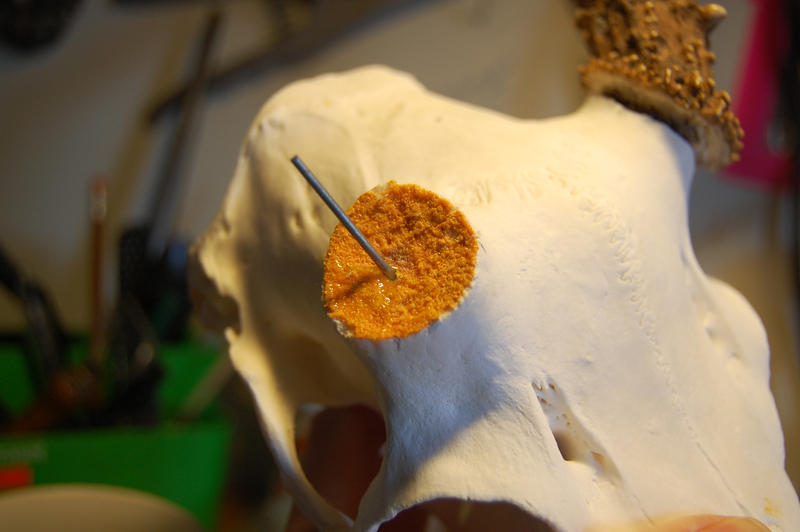 I drilled holes at all four connection point and inserted a steel bracing rod into each of the two on the skull. 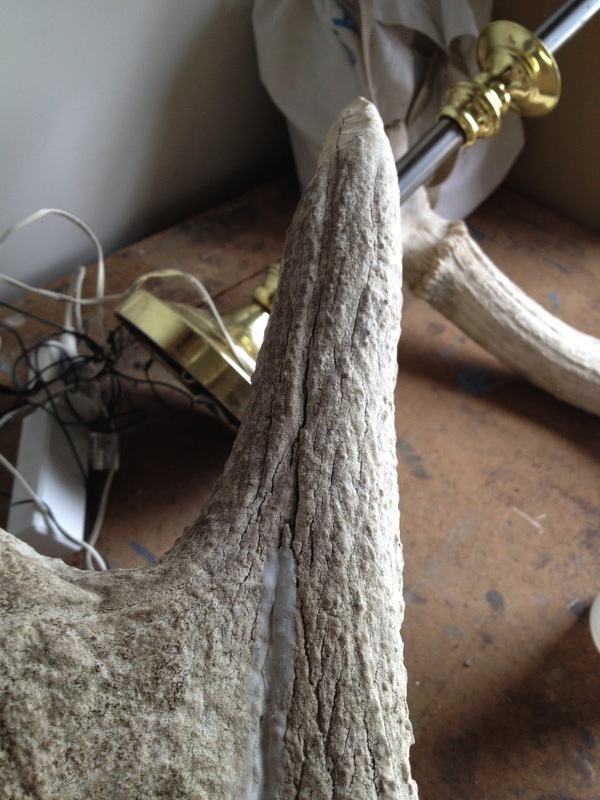 After securing with epoxy, I shimmied the antlers onto the bracing rods, forming a perfect union. 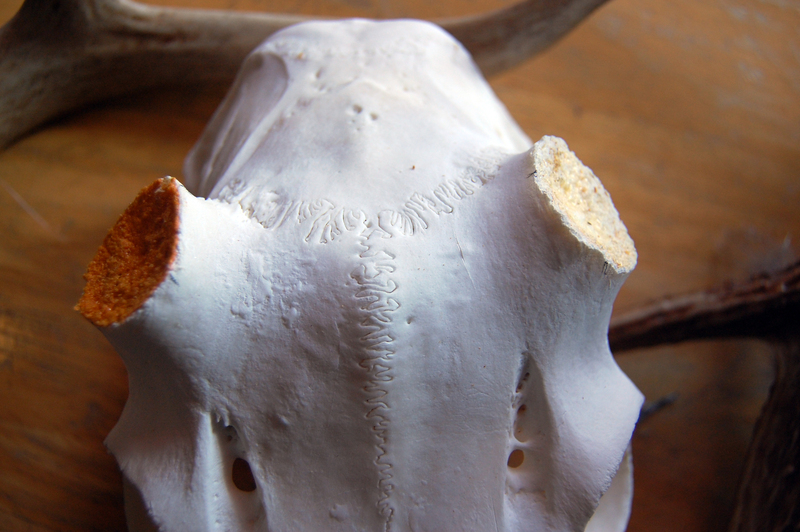 It took some measuring and finesse to ensure that the antlers would "land" in the correct placement in relation to the skull, on top of that, I made pencil notches along the outside which would line up when everything was in place. 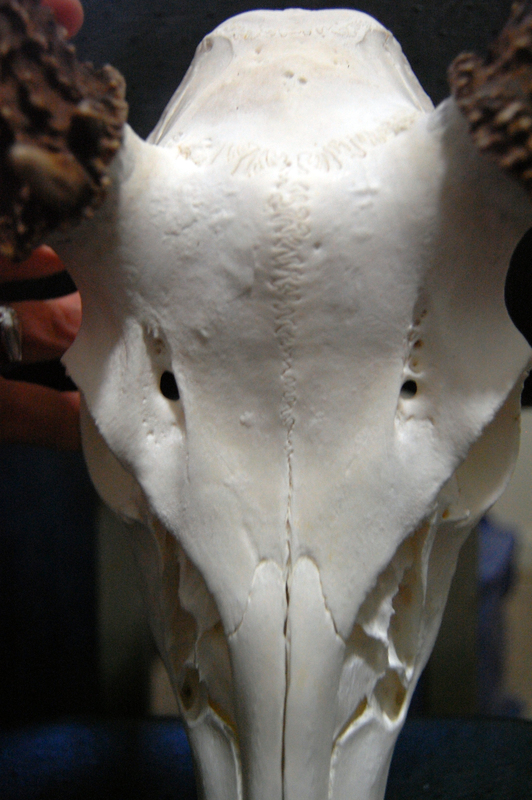 Now that the mount was back in one pice, I had to address the rough transition point between horn and skull. 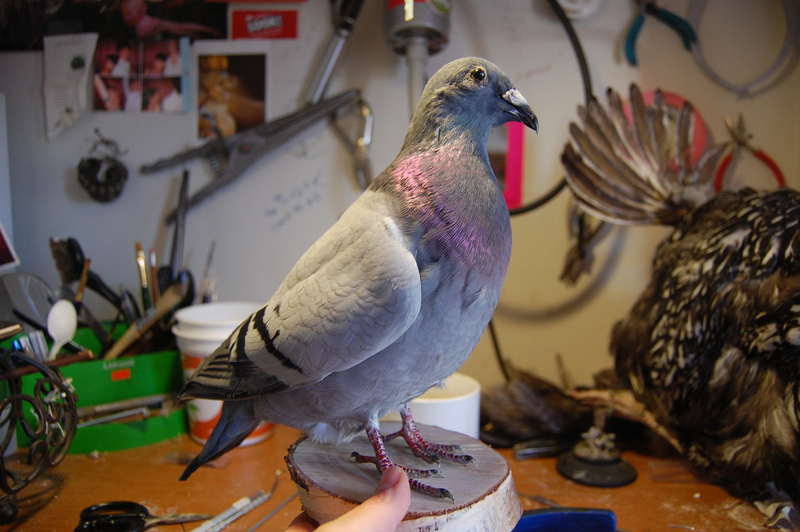 I used some top secret taxidermist sculpting clay to create a transition surface and blended it all together. 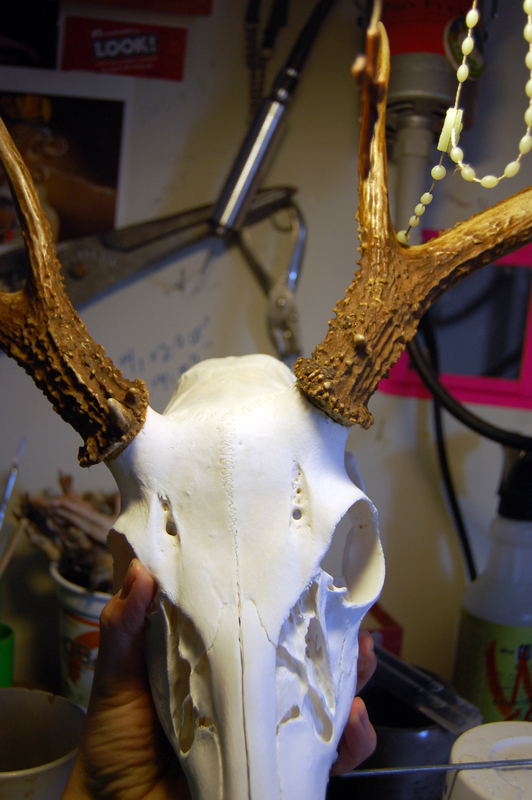 While it dried I applied texture to match the natural surface of that particular part of the skull. 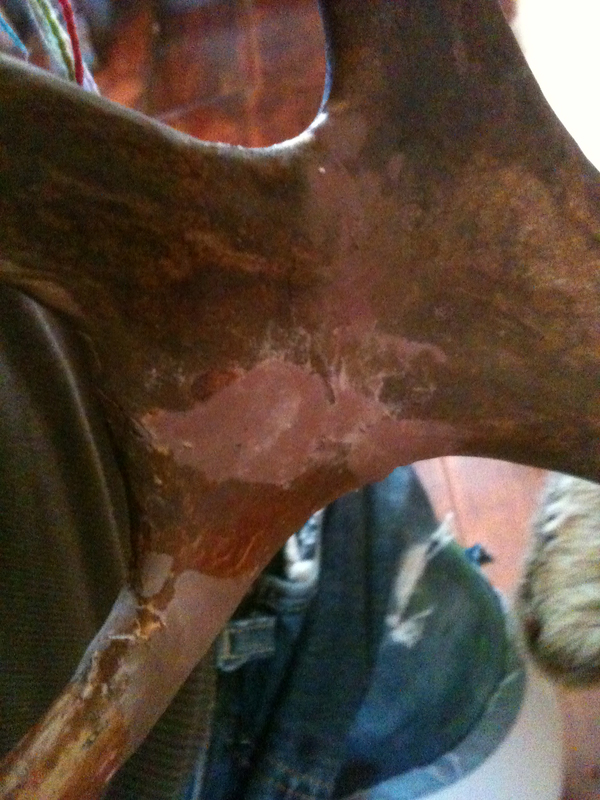 After it was set and dried, I painted the clay to further blend it all together. Here is the finished product. Unfortunately the fuller picture I took came out blurry but this gives you an idea. And the customer was satisfied which is all that matters in my book. Happy hunting (what's left of it)! 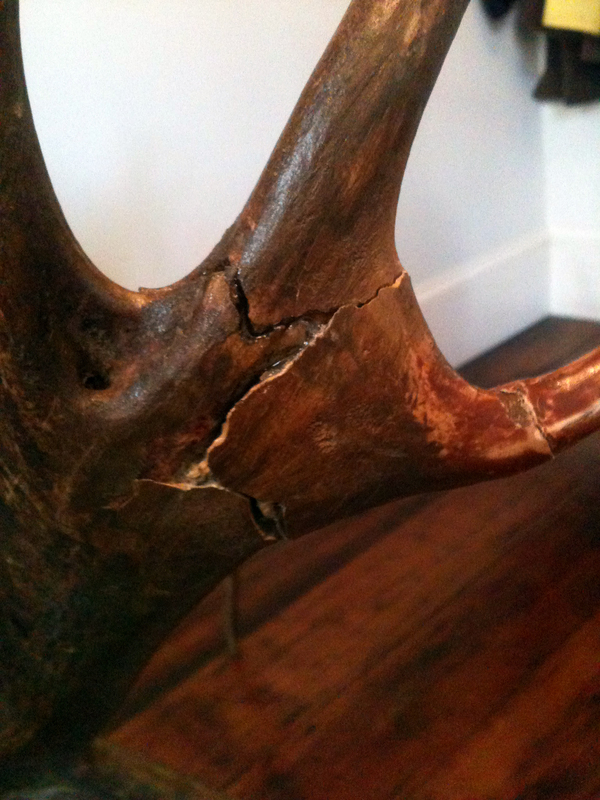 Crack is Whack, especially when it comes to antlers. 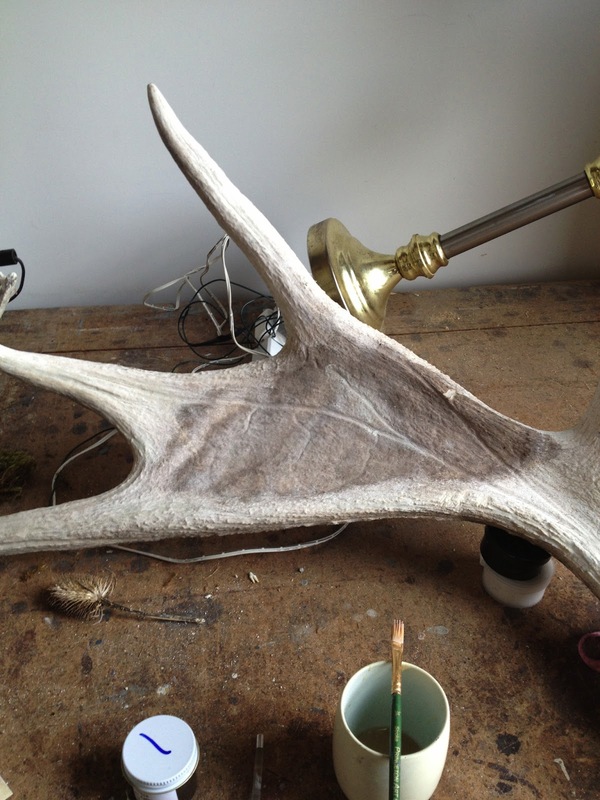 I was recently contacted by a friend of a friend of a friend with a Caribou mount that had suffered a cruel demonstration of gravitational force, resulting in a chipped and cracked antler. When I stopped by to inspect it, it became quite clear this part had been broken before and undergone a sub-par repair job with mis-matching paint to boot. 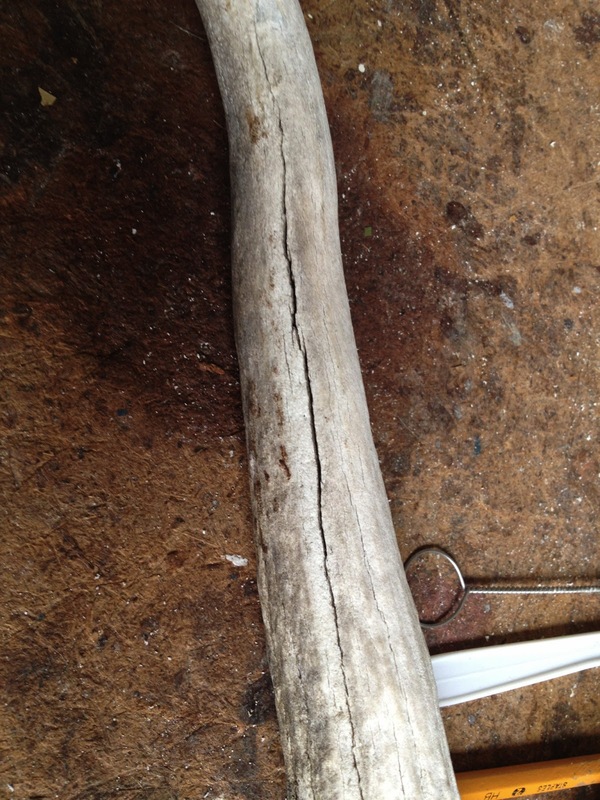 What I did first was use an industrial strength epoxy bond to get the actual pieces back together. 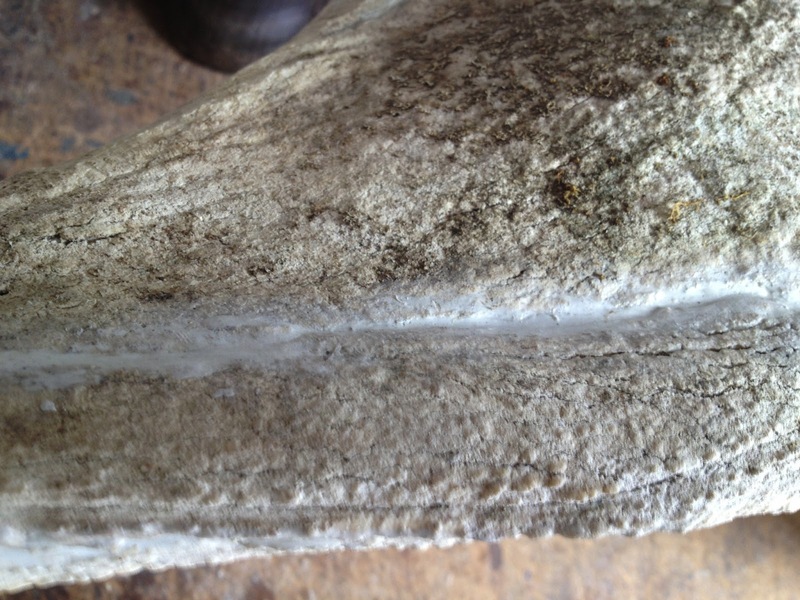 After it had set, I recreated the original surface with a sculptural epoxy. I finessed it with water and my fingers, then allowed it to dry. After completely drying, I did a little sanding (like my tween girl nail polish?) 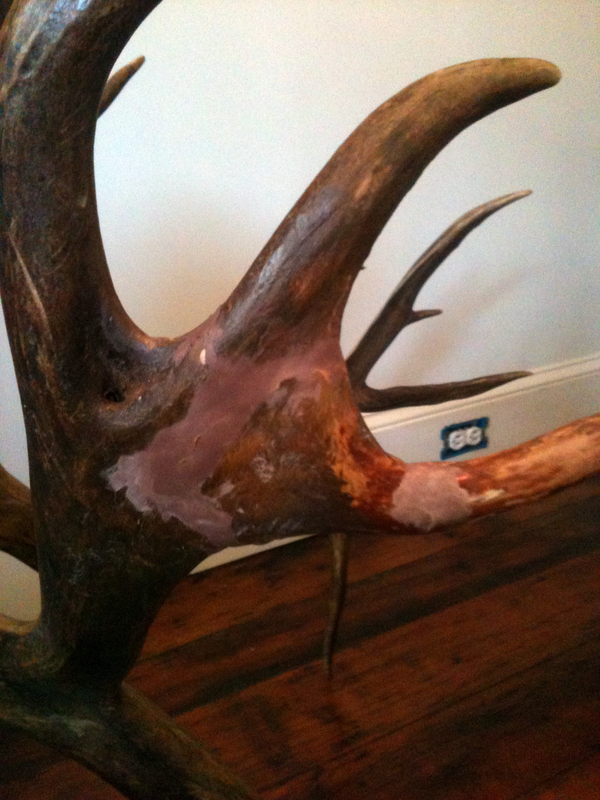 to eliminate any hidden bumps or uneven surfaces that didn't belong on the antler. Next came the painting. A few coats, some blending, some magic, and voila! 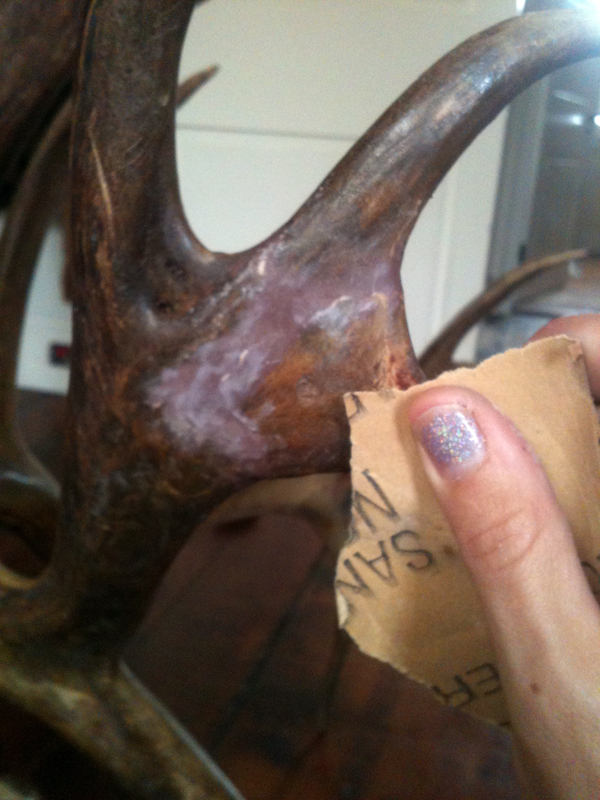 Repaired antlers. 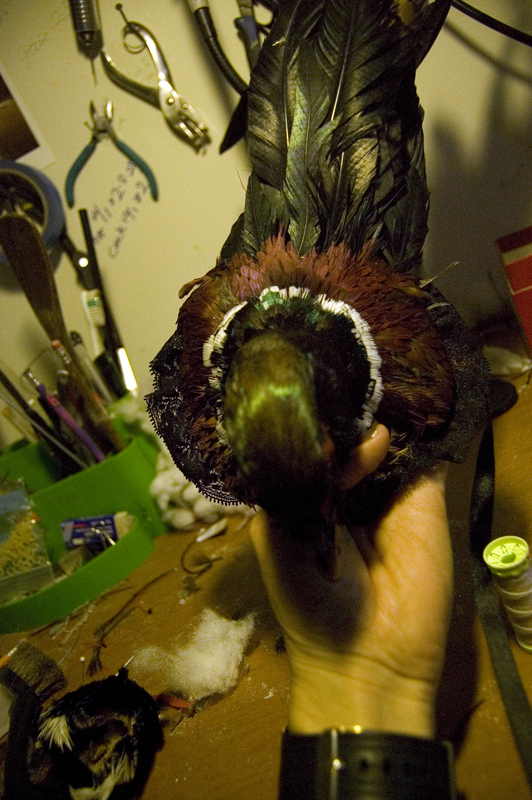 And that, my friends, is just another one of the things this taxidermist does. Like a ________ with its head cut off. I recently came into contact with the striking and fabulous Kiki Hughes, proprietress of Kiki Hughes Boutique in Philadelphia. Word to the wise: click on that link and check out her store if you're near Philly. 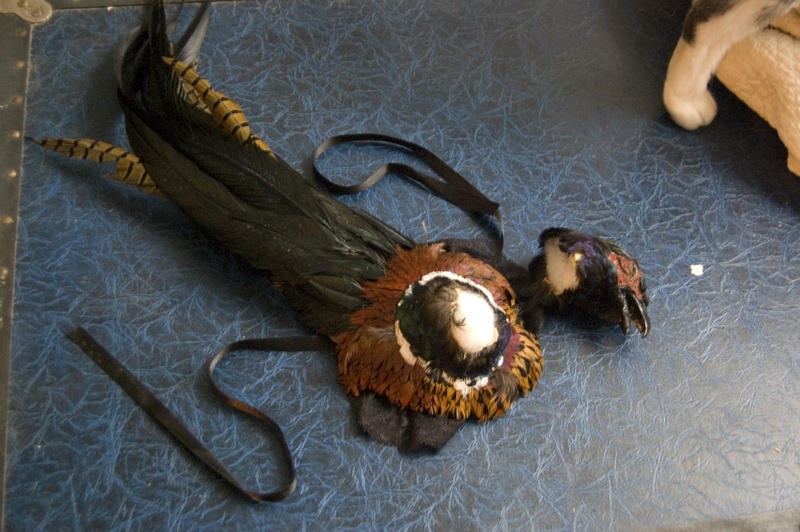 There are some truly, truly gorgeous wardrobe pieces in there (like my ostrich feather skirt!!!) and all the clothing is merchandised in such a clever and unique fashion that you'll kind of get sucked into a time warp and forget how long you've been there ogling at the displays. 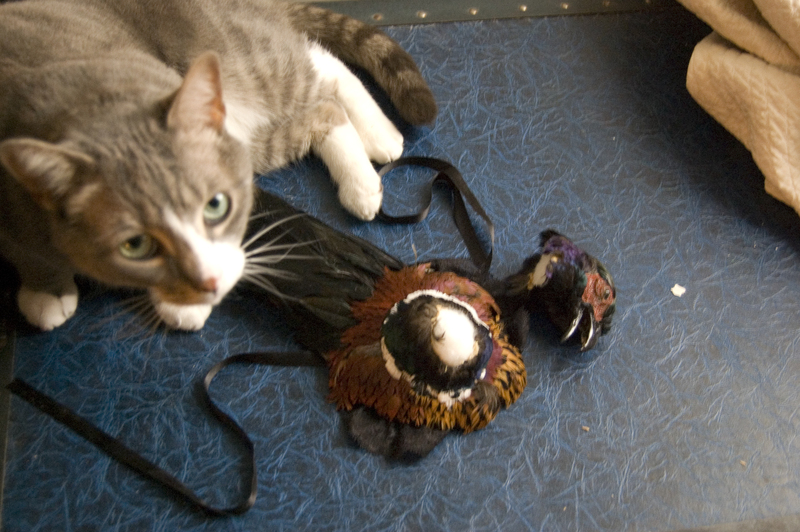 Anyway, Ms. Kiki has this lovely pheasant head hat from her personal collection which her cat made into a sacrifice one night by ripping the head clean off. What killer instincts! 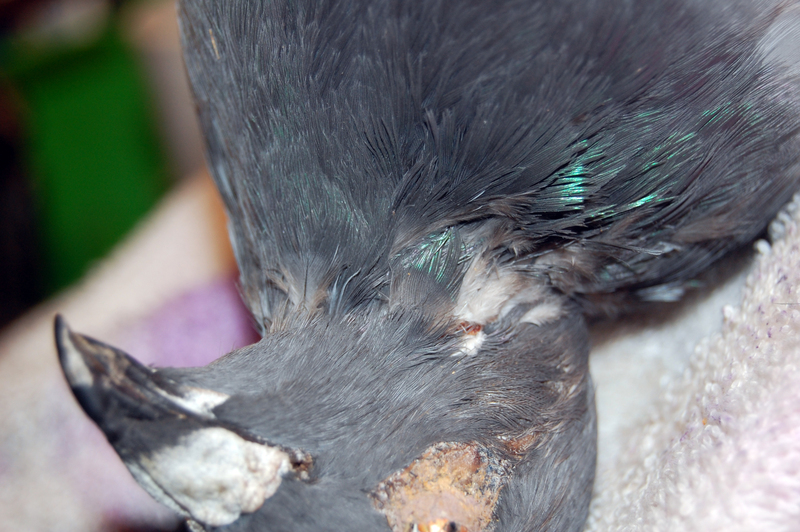 Upon closer inspection, this bird was more than just decapitated. He was straight ripped. 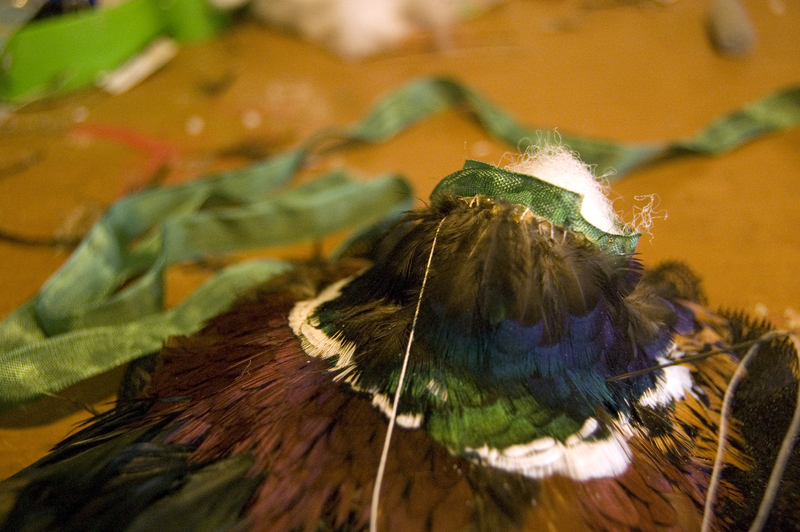 I started by sewing binding tape over the cracks and along the edge of the head which I then reinforced with an adhesive. This would provide a stronger bond once the whole thing was sewn back together. 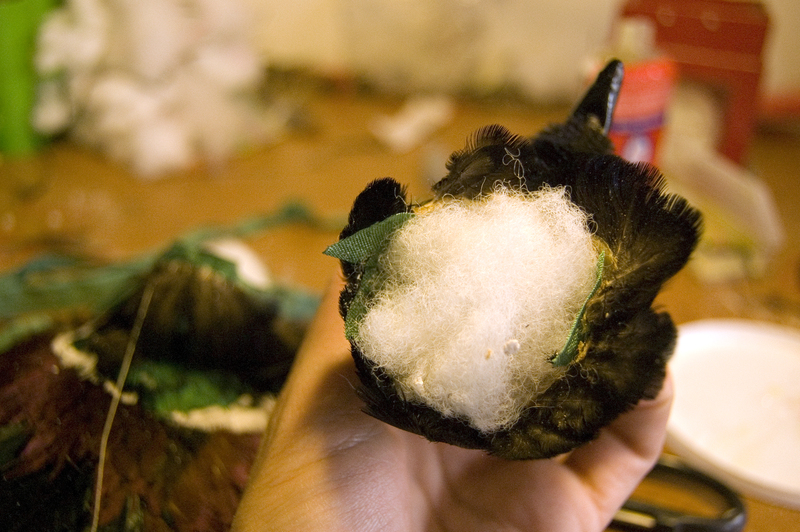 Finally it's time to sew the head onto the body. 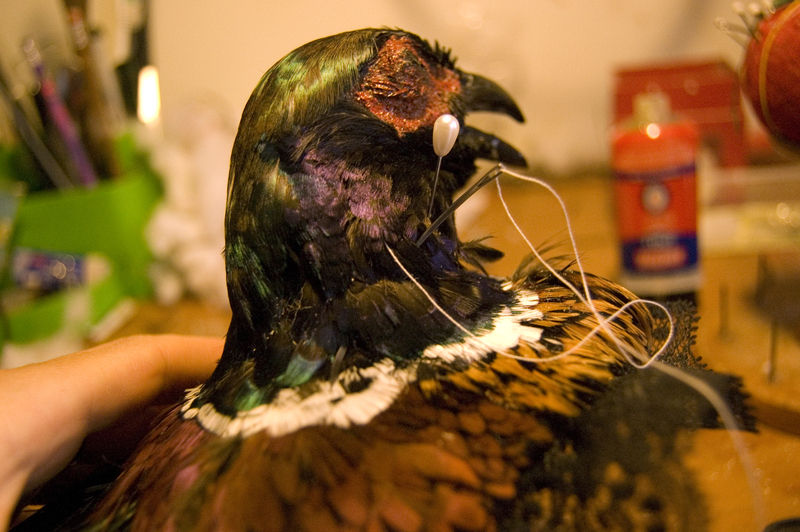 This is where curved needles come in handy. 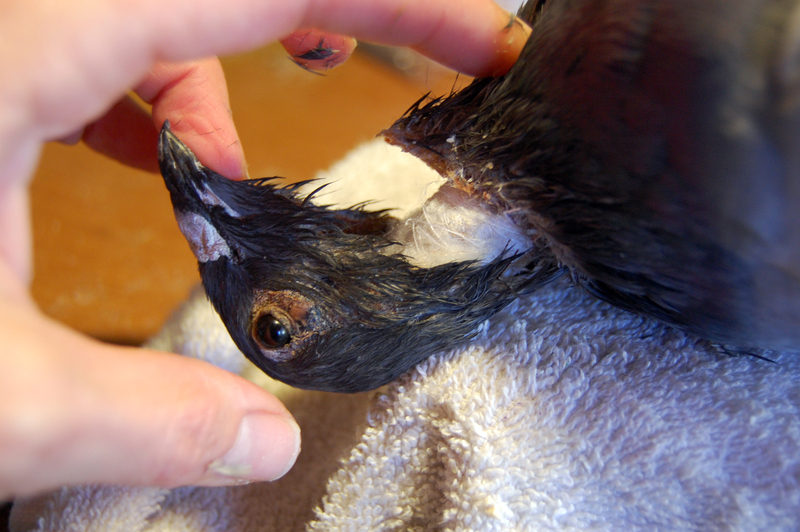 After the head was securely reattached, there was still the job of filling in the blank skin spots with feathers. 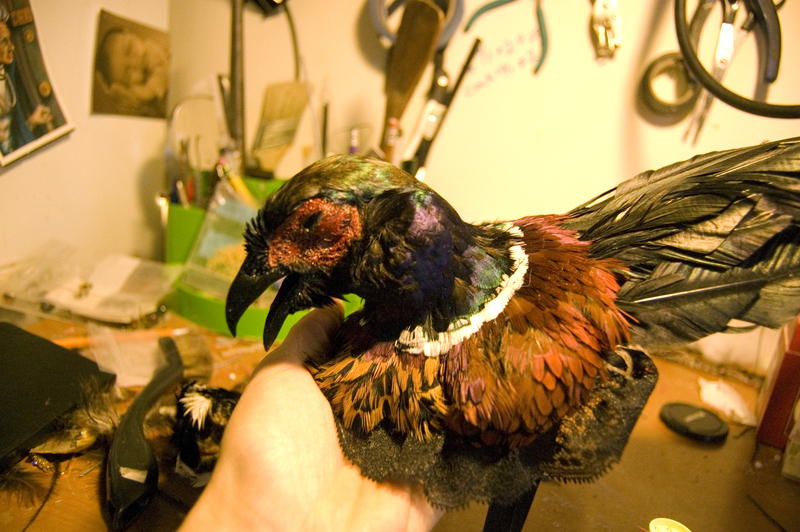 Fortunately I have an abundance of pheasant plumage on hand and was able to find the right shade/size.shpe to blend in with the originals. So the moral of the story is: I do repairs. 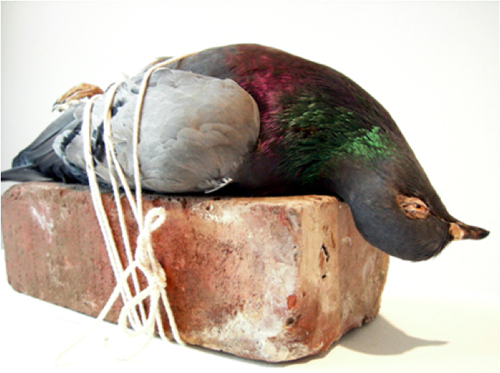 Please feel free to contact me should an old piece of taxidermy in your collection need some new life breathed into it.